Drs. 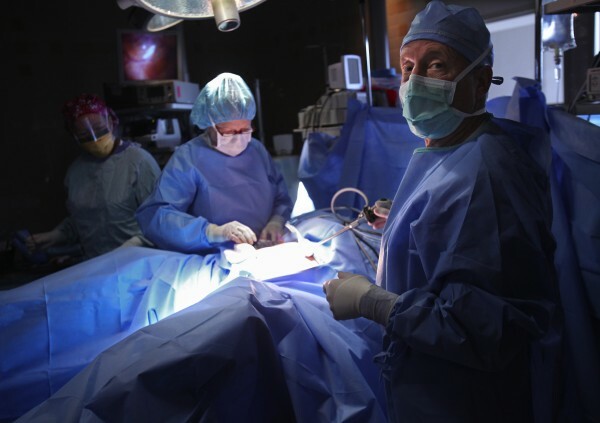 John Lenihan and Carol Kovanda ready a patient before using a da Vinci robot surgery system in Tacoma, Wash., in 2012. 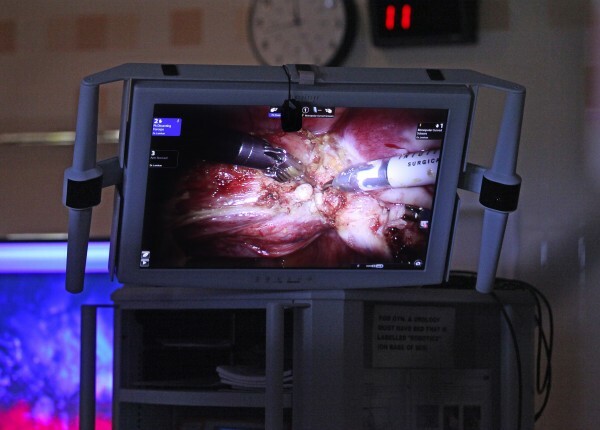 A monitor displays what is happening with a da Vinci robot operating system as Dr. John Lenihan operates in Tacoma, Wash., in 2012. A surgical robot used by three Maine hospitals is under federal scrutiny following reports that the units may stall during procedures and problems possibly linked to the devices are on the rise. Intuitive Surgical Inc., the maker of the $1.5 million da Vinci robotic surgery system, issued an “urgent medical device recall” on Nov. 11 alerting customers that friction in the instrument arms of some of the robots can cause the units to stall momentarily, according to a Dec. 3 notice on the U.S. Food and Drug Administration’s website. The problem affects up to 1,386 of the instrument arms worldwide. While the notification was classified as a “recall,” the robots aren’t being pulled from operating rooms. The FDA uses the classification to identify medical devices that could “cause temporary or medically reversible” health problems. Intuitive Surgical has asked its customers to inform health care workers of the notification and schedule inspections of the devices. The da Vinci robot, promoted heavily by many hospitals as a cutting-edge surgical technology, is in use at Eastern Maine Medical Center in Bangor, MaineGeneral Medical Center in Augusta, and Maine Medical Center in Portland. All three hospitals said Thursday that they’ve found the device to be safe. The da Vinci is commonly used for prostate and gallbladder removal and weight-loss surgery, among other procedures. Surgeons can manipulate tiny surgical instruments attached to the robot’s arms using hand controls at a computer system situated a few feet away from the patient. A video camera on one of the arms provides a view inside the patient’s body. The FDA is investigating a spike in the number of problems reported with the robotic surgeries. The agency said last month that the number of “adverse event reports,” which include deaths, injuries and system malfunctions, had more than doubled of Nov. 3 compared with all of last year, Bloomberg News reported. An FDA spokeswoman told the Associated Press that the increase may reflect greater awareness among doctors and hospitals of the need to report problems. It also could reflect wider use of the technology. Between 2007 and 2011, the number of procedures performed with robots including the da Vinci skyrocketed by more than 400 percent in the United States, according to a study by Martin Makary, an associate professor of surgery at the Johns Hopkins University School of Medicine. Despite the widespread adoption, a “haphazard” system of reporting complications leaves a muddied picture of the safety of robotic surgery, Makary said in a news release about the study. Of the one million robotic surgeries performed since 2000, 245 complications, including 71 deaths, were reported to the FDA, a very low number given the number of procedures, Makary said. His research team also cited news accounts of incidents that were not reported to the agency until after appearing in the press. Hospitals are required to report the incidents to the manufacturer, which must then report them to the FDA. “The robot has allowed me to do more surgeries on more complicated patients in less invasive ways now for close to a decade,” said Dr. Michelle Toder, who leads the hospital’s epicenter team. Robotic surgery is at least as safe as open or laparoscopic surgery — which involves small incisions and tiny cameras maneuvered directly by a surgeon’s hands — and often leads to better pain control, less blood loss and shorter hospital stays, she said. The robot allows for greater dexterity, and surgeons can magnify the surgical site on a monitor, making it easier to identify blood vessels and nerves, Todor said. Todor was not aware of any adverse events attributed to EMMC’s robot, though complications can occur as with all types of surgery, she said. The hospital hasn’t experienced the friction problem cited in the recent FDA notification, she said. The recent bump in the number of adverse events was largely spurred by doctors and hospitals responding to Bloomberg’s reporting earlier this year about dangerous complications associated with da Vinci robots, she said. Some of the reports were old or involved incidents that weren’t the fault of the robotic technology, Todor said. “Everyone felt really compelled to make sure that they were being super vigilant about reporting, that there wouldn’t be any appearance of hiding or underreporting or misrepresenting potential issues associated with the system,” she said. The more data that’s provided to medical device makers, the safer that health care technology will be, Toder added. In a statement on its website, Intuitive Surgical said it has inspected about 70 percent of the affected instrument arms and will repair or replace them as needed. Surgeons may feel the excessive friction as resistance, and if they push through it, the instruments may stall and then suddenly catch up to the correct position, the company said. Matt Paul, a spokesman for Maine Medical Center, said the hospital has experienced no adverse events associated with its da Vinci robot. The hospital will continue to monitor the safety reports but has found robotic surgery to greatly benefit patients, he said. At MaineGeneral, Dr. Steve Diaz, chief medical officer, reported a similar experience. “I’ve read the report and we have not had any issues with the movement of the robot noted in the warning, and we haven’t had any adverse events as a result of surgeries performed with the Da Vinci robot,” he said in a statement. In promoting robotic surgery to patients, hospitals are also looking to attract business to help cover the costs of the expensive device. While she hadn’t reviewed the da Vinci’s safety record, Lisa Letourneau, executive director of Maine Quality Counts, a collaborative working to improve the quality of health care, said the issue is emblematic of the exploding use of high-tech technology and testing that may not necessarily lead to better results. “We know there is a lot of use of expensive resources in health care, and in some cases overuse, and we really need to strive for appropriate use,” she said.